Blacksmiths make weapons and are one of the two life skills that enchant weapons. They may also enchant bracers. Sadly, they are limited by raw materials, vigor and bound silver (taels). In order to become a blacksmith, you will need to talk to any blacksmith NPC in any town. To find the closest one, open the Life menu (the default hotkey is “i”), select Blacksmith, then click the small man in the bottom right who looks like this. This will lead you directly to the blacksmith shifu who will also sell you the basic recipes. Recipes come in various tiers. A tier can have more than one for each weapon. In order, the tiers are: Wood (lowest), Iron, Copper, Silver, Gold, and Jade (highest). When you first become a blacksmith, all you learn are wood recipes (most of which are sold by any blacksmith NPC). Iron tier recipes are found in some world chests and in Twilight Village (Forbidden Instance). Copper tier recipes can be found in Green Cloud Castle (Forbidden Instance). Silver tier recipes can be rewarded Monday for being one of the top 10 blacksmiths or from Peacock Villa (Forbidden Instance). 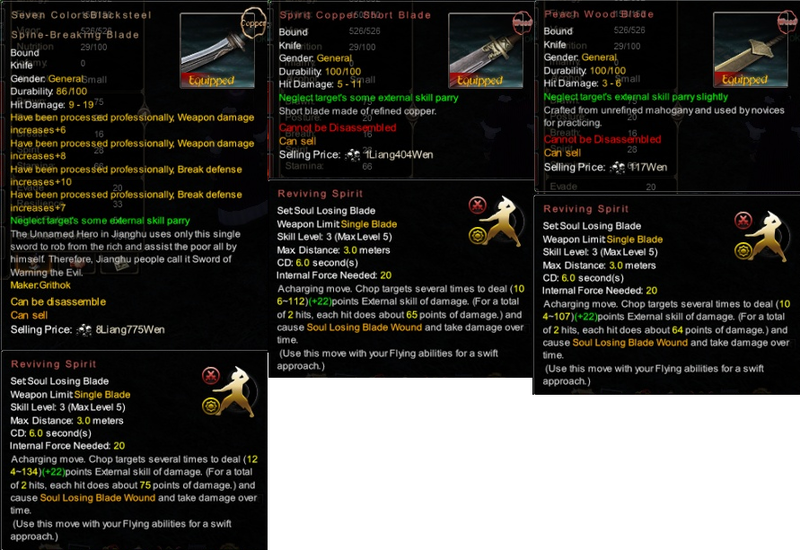 Martial Single Sword is a wood recipe from a vendor and says Weak Body and Mind. Hundred Blades Single Sword Book is an iron tier recipe and states First Understanding. Taihua Single Sword Book is a copper tier recipe and states First Understanding. Superior Weapon Single Sword Book is a copper tier recipe and states Realized Potential and requires a workshop. Refined Gold Single Sword Book is a silver tier recipe and states Martial Intuition and requires a workshop. Swallow Feather Single Blade Book is a silver tier recipe and states Martial Intuition. Just because an item is of one tier does not mean they will only require materials from their own tier. Materials from multiple tiers are usually required to forge an item — silver, lead and copper being the most common materials required for many recipes. The workshop and silver tier recipes require rare dungeon drops. Swords in general also require Malachite, a material that can be gained from dungeons and (rarely) beggar bags. The normal price for those are 30L a pop, which raises the cost of swords in general. Most other weapons will require a handle or hasps from a craftsman. There are also times when you will require cloth from a tailor. There are very few weapons that a blacksmith can make alone, and none of the worthwhile weapons are solo jobs. Having a guild or lots of money helps. A weapon without enchants is worthless. The damage you may get is rather small just from the base damage. When a weapon is created, it will have a random number of enchantments. For example, Copper weapons can have anywhere from 0 – 4 enchantment slots on them. Each enchantment will be done by a blacksmith or chef and will be listed on the weapon in yellow as to who should enchant. It will also cost 10 unbound liang per enchant, which is a tax placed by the game and goes to no one. Chefs will give out one of two enchants randomly — either weapon damage or break defense. Blacksmiths, in contrast, have a variety of different enchants: weapon damage, break defense or 10% to a single weapon skill from a random weapon set (that suits the weapon being enchanted). If a weapon gets 10% to a certain weapon set, like Rosy Cloud Stab, it can get another 10% on it and it will also be from Rosy Cloud Stab. These two bonuses on the same skill stack, and jade weapons can have up to three 10% enchants on a weapon! First, you need to make pupil ingots. This requires wood tier recipes to be made and broken down. Every time you disassemble a weapon, you will be taxed bound liang. Now you should have refined powder. You need to combine 5 of these materials into a pupil ingot. This also costs bound liang. Some wood tier recipes are more efficient in materials but less efficient in bound money. Others require more materials but saves on bound money. You have a limit of 360 bound liang a day. This will hamper anyone who tries to craft a lot as fuel gets really expensive and so does manufacturing enchantment items. Pupils are the first enchant material required. After an enchant or two, you may need black burning ingots. These require 5 copper stones and 5 pupil ingots to make 1 black burning ingot. So back to making pupils you go, and then to make copper stones. If you are a high level blacksmith and try to make iron tier weapons you have a good chance to crit on those and make them copper tier weapons. Only iron tier weapons give you copper stones from disassembling them. If you have a low level blacksmith alt, you should keep him low level so you can constantly get copper stones. Next enchant is heavy forging stones. These take 5 black burning ingots and 5 iron stones in order to make 1. So you go off and make a copper item, break it down, and make iron stones from this and combine them with black burning ingots. Enchants get exponentially more expensive in materials as you go up. Copper stones, on average, cost more than iron stones due to high level blacksmiths having issues making copper stones. Having an alt blacksmith to create pupils is a good way to help with the bound liang limit. Of the enchants we listed earlier, break defense is useless. It ignores the armor on a player and it is nowhere near as good as the other enchants. A weapon that gets break defense can sometimes go down in price more than if you never enchanted it and you may not recoup the enchanting costs back from the weapon. Single swords and single daggers have a lot of different sets on them. Single swords can have 2 wudang sets, 1 scholar set, and 2 jianghu sets on them. Later on more jianghu sets will be in the game. A sword with a nice wudang set will be very expensive on the market and you will make a lot of money if you make this weapon due to how random this can be. No one will buy the jianghu sets. Oh yah, it still costs malachite so there is another 30-40L down the drain per attempt. Copper tier weapons can crit silver, and this raises the cost of enchanting by two or three times. The first enchant on a copper weapon is 20 pupils and the first enchant on a silver crit is 75 pupils. That said, this is still easier and costs less than making armor or jewelry. Each craft costs vigor which is your daily allotment of how much you can craft. If you are full of vigor, you also have a pool that you can draw from which refills every day. You will slowly regenerate vigor while online, and VIPs can do it while off line. Joining a guild and raising your life skills will raise how much vigor you can hold. My smith is currently at 848 vigor and a copper sword takes 30. All hidden weapons take more vigor to make. Every time you level up a life skill or become top 10 in a life skill on a sunday, you will get Tonifying Chi pills. These restore 30 vigor and you can generally get a large stack of these as you play the game. You will rarely need them. Copper tier weapons cost 7 to 10 dry wood fuel, the fancy kind, which costs 2.5 bound liang each. This means I can go through a lot of my bound trying to craft someone a silver weapon. The manufacturing of the enchant items are the next thing that will make me hit my daily bound cap. After that you have to either wait for midnight the next day or use unbound. Honestly there is no real good way. Raw materials are always needed for the weapons people will use or the weapons that are broken down for enchant items. A all weapon damage or 20% copper or silver weapon will gain you a lot of money, but are rare. This is lottery rare and will cost you a lot to even attempt. Enchantment materials though are never a gamble since people always need them. You save the other smiths vigor and bound money so this is normally good money and most easily done by low level smiths. Being a top 10 smith also means you can get a rare recipe to sell on the market or a small chance to get a workshop which you can also sell. There is no weapon for unarmed weapon sets, but bracers, made by tailors, can be enchanted by smiths to get 10% to unarmed sets. Leggings can also get leisure kick. As goons like to say, chinagame.exe. This is Iron Force and Steal Fist, the punch ability, in the Soul Chasing Claw set. This is one of the many translation errors you will find in this game. These are rare dungeon drops, random encounter rewards, or top 10 blacksmith rewards. A workshop has to be placed at certain points on maps and will manufacture 2 weapons. Each craft takes 2 or 3 hours and the workshop lasts for 6. You may get extra weapons from the craft that were not intended, so if you see a super wood tier weapon on the market place, that is what those are. As of writing this, one of the flying claw workshop recipes is bugged and only gives iron tier claws out. Blacksmiths have two ways to craft. Wares is the traditional way of making items, just click button and wait. Precision Blacksmithing is where you play the bejewelled / puzzle quest game. It has a chance for extra rewards or decreases consumption but no one really knows what that means. If this method is used for bulk crafting, all crafts come out the same. Generally some high level smiths will try to create copper stones this way by bulk crafting iron tier recipes and not doing well in Precision Blacksmithing. Even then they could still get nothing but copper crits from it. If you fail at this you will lose vigor and durability on your crafting tool. The more crafts you try to make at once, the more skulls you have to get in a row, making it harder. In your life menu, hover your mouse over the exp bar. It will read poorly, chinagame.exe, but it will tell you how much exp you can gain today. If you do earn all of it, it should roll over to the next day. It can roll over for up to a month and different levels of smithing can have different daily exp limits. Playing bejewelled against your shifu or other players is the best way to level it up. Do not grind out weapons. Each round against your shifu will earn you more and more exp up until round 12 where it resets to round 1 if you win. Eat a large riyu pill or small riyu pill to get even more exp per round. You can save these for double exp week as the effects will stack. I’ve made a simple calculator based on raw material prices so I can gauge what I need to sell my weapons for in yanjing. You should be able to make a copy of the spreadsheet if you want to use it as well, and I am slowly adding new weapons as I feel they are worth it.